This project is fast becoming urban legend. Lets look at the cronology. The person the city bought ir from wanted to sell/lease to grocery outlet. A group of SL Citizens led by someone whose name escapes me, Judy Dicbar, something like that circulates a petition against grocery outlet saying it is not upscale enough. At the same time the city is retrofinng the downtown garage and has a large SL employer who will be impacted by not having the parking available. The city to appease the group against grocery outlet and to cal the large employer buys the store at a price. Now that the garage is being finished the city makes a deal to put…. a grocery store on the lot costing the city 6 million. But we now have different citizens with different complaints, sweetheart deal, dont need/want Chipotle, Peets, Fresh and Easy. The person who had the petition against the grocery outlet was me and my name is Johanne Dictor and you have the facts wrong. Our big complaint was that a grocery store was not right for this location, pure and simple. I personally think the Fresh and Easy grocery store is a problem, too and I am not in favor of it at all. As Marga said that was not the concept for that space. 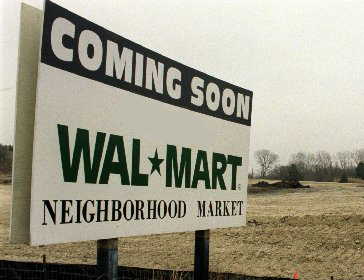 I hope this article about Wal-Mart taking over Fresh and Easy is incorrect; it would be an absolute disaster if Wal Mart took over that space. I think David Irmer is a responsible developer but you never know what he would do if Wal Mart offered him a great price for this piece of property. I would hope that Irmer is more sincere than that but you never know. Irmer acts like he really cares about San Leandro but he is just another developer trying to make money. I will say he did a great job on the Tri-net building and the new building that was just built. Mike, it’s not different citizens. I was one of the people who spoke against Grocery Outlet – both on my behalf and SLCAN – and I’m just as loudly speaking against Fresh & Easy. My issue with both is exactly the same: grocery stores are inconsistent with transit oriented development as most people will drive to get groceries. Unless you’re the type that shops every day (and then you would be shopping at specialty stores/farmers markets not packaged-havens like F&E and GO), you need a car to comfortably carry your groceries home. And after you’ve bought groceries, you are not going to stop by other nearby stores while your ice cream melts and your fish rots in your car – you are going to go home. So a grocery store will not help make downtown a destination. Of course, a parking lot doesn’t either – but at least it provides the /possibility/ of one day building the site into something that will benefit the community. But the whole Village Marketplace deal smells so off to me. It seems that to arrive to the purchase price what the city did is look at the mixed-use development they wanted to put there, figure out how much they could possibly sell it for and how much it would cost to build it, and then subtract the latter from the former. That gave them somewhere north of $6M which is basically what they ended up paying for the site. I’m filing a CPRA request to see if they actually got the property appraised prior to purchasing, I somehow think not. But, almost immediately after they bought the site, they give it to Irmer to develop with no word as to the mixed-use development they had sold to the citizens before.